The workflow association <workflow name> for content type <content type name> is not imported because the workflow with id <GUID> cannot be found. 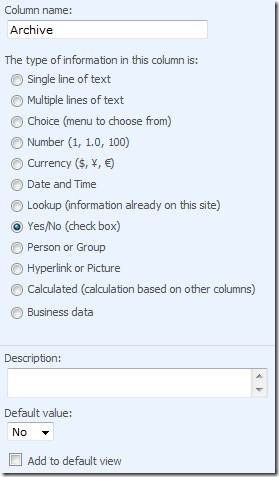 This entry was posted in Content Types, SharePoint 2010, Workflow on December 10, 2010 by Maarten Eekels. Recently, I received an intriguing question from a client of ours. They have a document library with a lot of project documents, mainly meeting agendas and minutes, but some other important documents as well. Now what they would like is filtering out the older agendas and minutes, but not all the other document types. 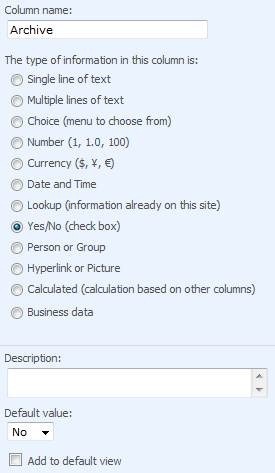 So just setting a Filter in a List View won’t do it. I assume you already have some kind of Document Type Column in your document library, to differentiate the types of document you use. I have named this column DocumentType and I have four types of documents: Action Plan, Agenda, Business Case, and Minutes. Now I only want to see the Agendas and Minutes from the past two months, and the Action Plan and Business Case. 1. In the Document Library, create a new Column to store some kind of flag which we can use to filter documents on in our View. I created an Archive column of type Yes/No, default No. 2. Next, create a new workflow with SharePoint Designer. I called it “Set Archive Status to Yes”. Make sure you enable the “Allow this workflow to be manually started from an item” option and disable the other two start options. Click Next. Choose the Document Types you would like to set the Archive flag for in the Conditions part, and set the Archive flag in the Actions part. 3. Finally, you have to create a policy on the document library, to call the workflow you just created. Go to you Document Library settings, and click the “Information management policy settings” link. Choose “Define a policy…” and click OK. 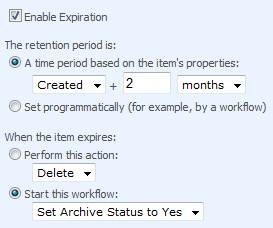 Enable Expiration, choose the time period after which you would like to execute your workflow and select the workflow you created under step 2. Voilà, you’re done! Of course you would have to modify your list view to filter out the documents with Archive set to No. 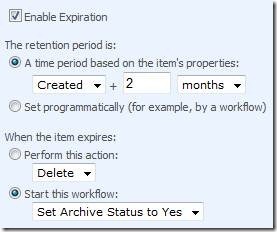 This entry was posted in SharePoint 2010, Workflow on March 9, 2010 by Maarten Eekels.